This app helps players to choose numbers with an algorithm, UNIQUE IN THE WORLD for California SuperLotto Plus draws. Play California SuperLotto Plus with the best code generator in the WORLD! 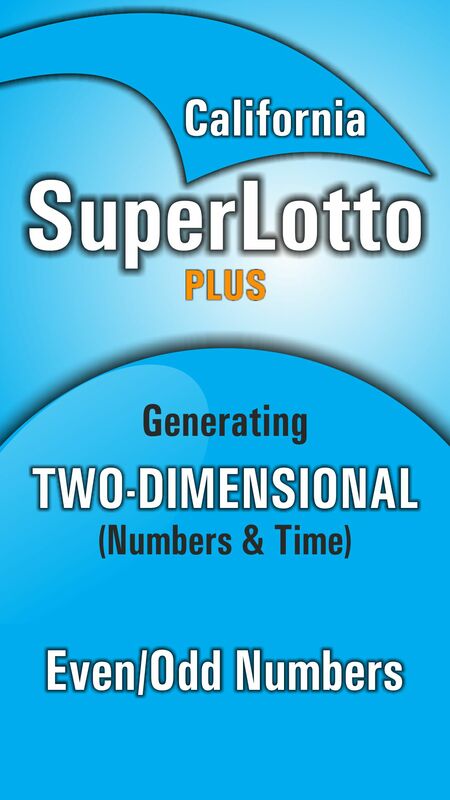 California SuperLotto (CA) two-dimensional app generating numbers contains an algorithm, UNIQUE IN THE WORLD that acts like real lottery draws. As in reality, every number is chosen in a certain time. This is how it happens with the app and it generates the time as well as the numbers, being the closest simulation to the real lottery draw. There is also a random option for Lucky Numbers and Mega Number that generates numbers randomly but in a certain time. The California SuperLotto Plus game was first launched in 1986. Unlike other lotteries that are played across multiple states in America, this lottery game just takes place in California, although thanks to the online ticket concierges, players from across America and the rest of the globe can now play on this SuperLotto. The SuperLotto has a minimum jackpot of $7 million. In the situation where no player matches all five numbers and one Mega number, the jackpot will roll over to the next draw. With no rollover cap, there are big potential jackpots to be had, with the biggest jackpot to date a whopping $193 million. According to a bill passed in August 2010, at least 87% of all revenue generated from ticket sales must go back into the Californian community – either via ticket sales, community funding or other state contributions. Currently, a whopping 94% of all revenue goes towards public education, player prizes and retailer compensation with just 6% being used for administrative expenses. There are two California SuperLotto Plus draws held each week on a Wednesday and Saturday evening. The draws take place at 19.57 PST and results are available to view here shortly afterwards. The draw is held at Lottery Headquarters in Sacramento and broadcast on various channels across the state. To play the California SuperLotto Plus, players have to select five numbers from 1 – 47 then one Mega number from a selection of 1 – 27. All of these numbers must be matched to win the jackpot, however if players match fewer numbers then there are eight remaining prize tiers. The overall odds for winning a prize in the California SuperLotto Plus game stand at 1 in 23, which mean people that participate in this lotto have a relatively high chance of winning one of the prizes available, especially when compared to the odds on national lotteries. If you find yourself lucky enough to win the California SuperLotto jackpot then you have two ways to receive your winnings. The first is a cash lump sum which will be a one off payment that will be lower than the advertised amount. The second option is to take an annuity payout which means you will receive your winnings through 26 annual instalments which will equate to the advertised amount (based on the current rates). This is the same as the Powerball and MegaMillions jackpots. This application has no link in no way with an California SuperLotto organism and it does not allow to participate in the official game of the California SuperLotto.